The Knights' new CD goes further down the quiet road, and farther into open spaces. In many ways, this has the flavor of the gentler side of the Torquays, with restrained delivery and a writing style that is in the general vicinity of George Tomsco. Long leaning whammy notes float out across the southwest desert, just before a restrained and pretty tune is launched. 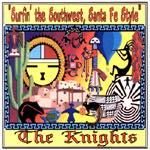 "Surfin' Santa Fe Style" is melodic and slightly familiar. With the flavor of old Mexican outposts in New Mexico, this serves to accompany a leisurely drive on an open asphalt ribbon. Very enjoyable. "Judi" lumbers down the esplanade as the sun hangs low in the autumn sky. The funkengrooven' floating of the rhythm is most relaxed. This is somewhat mysterious, a little misty, and fluid. The melody riff is just a bit down, while the soft tones are slightly optimistic. It's catchy, and very pleasant. With a rhythm pattern that could support "26 Miles," this fluffy track prances on the air like a dragonfly in late summer. It's playful like the Wedge's "Debbie," but much more relaxed. This is easily the best track here. It's quite friendly, with tasty restrained playing, well executed whammy, and a riff that stays put. There's more energy here than with other tracks, yet the delivery only hints of the power that could exist with this a vehicle. Very nice track. This is an updating of the Knights sixties track. It's a slinky island breeze kinda tune, with a friendly warm sound. Quite fluid and refreshing, though slightly sad. The low key approach to this Stan Jones classic, combined with a different arrangement, morph it into something else, while retaining the melody. Quite interesting, a little jazzy, yet somewhat off the point of the tune. I'm not complaining or saying it doesn't work, just that it seems a little pretentious to me. Still, I enjoyed most of it, and the change from the usual power glide delivery is refreshing. A little Spanish, a little romantic, "Legends" is warm and friendly, and quite like something from the pen of George Tomsco. Infectious, restrained, and very tasteful. A moderate delivery of an uncoverable tune - uncoverable because unless you do something other than try to mimic Ron Wilson fluid's drums, you can only come up second best. No new ground, though it's a little more of a blues than a surf tune as presented here, and the fire and spirit are missing.